The materials used to cover your convertible car come with built-in water and stain repellency, but over time their effects diminish. For this reason, it’s important to give your convertible’s top some extra care each season. A little cleaning and protection can go a long way. Follow these easy steps to avoid costly repairs and replacements. First, know which type of top you have. There are two kinds: vinyl and fabric. Proper care is easy but will depend on which type is on your car. Not sure what kind is on your car? If you can’t find the answer in your manual, make a quick stop at your neighborhood auto trim or car upholstery shop. The people who work there have likely replaced many damaged or worn out convertible tops and should be able to tell if yours is made of vinyl or fabric. Over time, it will become vulnerable to drying, cracking and fading. Even if your 4-wheel drive vehicle lasts forever, a neglected vinyl (or “soft”) top won’t. It’s a laminate consisting of several components, including a top layer of solution-dyed acrylic that’s very UV resistant as well as a surface treatment to resist soil, water, and oil-based stains. When your top starts to get noticeably wet—for example, the fabric has to dry out after it rains—it’s probably starting to lose its repellency. While the top won’t leak, this is a sure sign that it’s now susceptible to stains. Restoring and protecting your convertible top is easy. Simply clean, dry and protect with specialty solutions made especially for each type. With a high-quality product like 303® Fabric Convertible Top Kit or 303® Vinyl Convertible Top Care Kit, the entire process easily can be done in a couple of hours. But don’t just take our word for it. Head on over to Cool Rides Online, where Autogeek Mike Phillips walks you through a step-by-step guide (pictures and all) for cleaning and protecting virtually any convertible top. As long as a fabric convertible top’s stitching stays strong, water will not seep through, or “wick.” Wicking can be a very expensive warranty problem and often necessitates replacement of the top as well as mildewed carpeting and upholstery. To minimize wicking, convertible top manufacturers often treat the seams with 303® Fabric Guard. You can do the same at home. Would you know what material my 2011 Mercedes E350 convertible is made from? Is it vinyl or fabrics? Which would be the right 303 protectant to use? Is my 2011 Mercedes E350 convertible top made of vinyl or fabric? Which is the correct 303 protectant to use on it? Convertible top care is always important in order to keep it clean and well maintained. 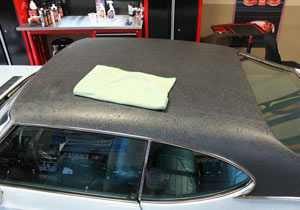 Thank you for sharing some good tips on taking care of vinyl and fabric convertible tops. While cleaning convertible top yourself then first try to remove excess dirt and debris then go for the further cleaning process.